If you haven’t seen the rock painting trend taking over Pinterest you must be living under a… just kidding! But really, painting rocks and hiding for others to find is the newest thing to do and I am totally on board with this activity. Simple, right? I’m going to make it sound a bit more complicated, but stick with me. Trust me on this one. Don’t bother trying to collect them as state parks and wildlife refuges prohibit the removal of anything from their property and it will take you forever to find them elsewhere. You can find stones in the floral section of any craft store and with a coupon, get a bag of about 10 for around $3. Or, you can go to a company that sells bulk landscaping materials and get a way better deal. Ask for 1-3″ river jack stone. Most places will let you buy in small quantity and you can hand select the best stones for painting. I got an entire 5 gallon bucket full for $5 at Delaware Landscaping Services in Dover! If you buy them at a landscaping supply store, you’ll definitely need to wash them first. I just pop a few in the dishwasher when I run a load of dishes. 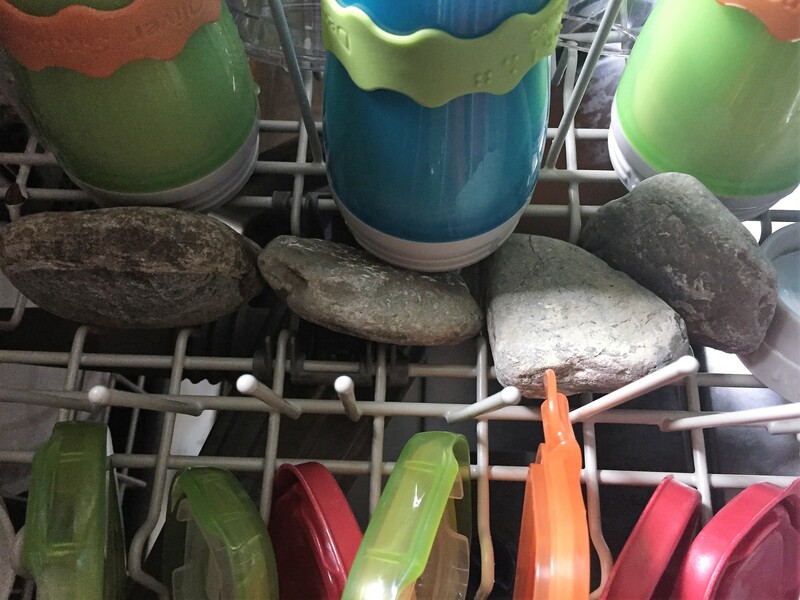 I’m lazy, there’s no way I’m hand washing rocks. They come out perfectly clean with zero effort. There’s no real instruction for this part. I say, use whatever paint you want and get creative! Just remember that it may take some time for someone to find your mini masterpieces, so you will want to seal them with a spray topcoat before placing them. I had a can of Kilz in the garage, so I tried using it as a white basecoat on a sample set of rocks and it worked beautifully. Great coverage and dried quickly. Then, I didn’t have to use as many coats of acrylic paint to achieve the shade I wanted. This is the fun part!!! There are some rules that we all have to follow though. 1) Do not place rocks in “leave no trace” locations. This includes state parks and national wildlife refuges. 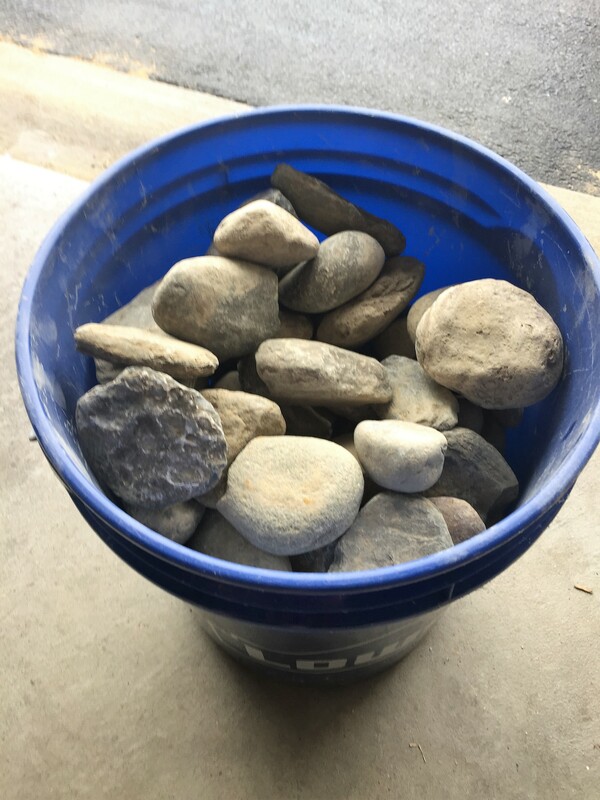 2) Do not place rocks on private property or at businesses unless you have permission. 4) DO place rocks at playgrounds, town parks and public areas where people will stumble upon them. Ultimately, the painted rock project is a scavenger hunt for those who are looking for them and an act of kindness for anyone that accidentally finds one. Some of my favorite rock designs include inspirational sayings or simple words of positivity. I’m not a very artistic person but I’ve found rock painting to be very relaxing, even if all my works of art are hideous. The best part about this activity is that it doesn’t matter what they end up looking like. Anyone at any skill level can do it. Hiding and finding the rocks is a great way to encourage people to get outside and go places they may not normally go to. Knowing that you may be brightening a stranger’s day is a bonus perk. Because I love this concept so much, I’ve decided to take the rock game to another level. From now on, The Buckit Blog will be hiding rocks at every adventure location we go to (that we can.) Every rock will be assigned a number. If you find one of our rocks, send me the number and a photo of you holding it to be entered to win a prize EVERY month! Every rock you find is an entry so if you find all 5 rocks hidden at one location, you get 5 entries for the month. Prizes will be age appropriate so adults and children alike can participate by following in our footsteps. Keep an eye on the Instagram account for hints and good luck! Delaware Rock Hide and Find!